So I just finished playing some Hotline Miami, the top-down action game that seemed to take the internet by storm late last year. I picked it up in the latest Humble Bundle, in addition to a few other games I never got around to playing on release. After jumping into the terribly violent maelstrom that is Hotline, even after this short amount of time, two things are abundantly clear. Secondly, when I do succeed, I find myself attributing luck more than any sort of skill. See, Hotline is fast, very fast. A little tip at the screen in fact encouraged me to go quickly and a point calculator at the end of every match restates the value of a mad horrendous dash through the level. Yet this high-speed careening into mayhem does not lend itself to calm analysis and strategic execution. The pace of the game creates a strong sense of randomness. Take this example. Coming down a staircase, pipe in hand, one armed guard sits around the corner. I quickly sprint toward him, lay him out with a pipe to the head, and then get mowed down by another guard I had missed nearby. With an instant reset, I'm back at the staircase and try again. This time, success. No guard takes me out from afar. I lucked out. Of course the difference between the two runs is the hair's breadth distance that kept me out of line-of-sight from the second armed guard. Still, since the game values speed, and the controls themselves send me zipping around the level, I have no time to measure my way through the level. Instead, I slam up against that wall just to reload and before I know, I'm done. I have killed everything in the room. I should feel good about my victory, like I overcame the challenge. Instead I just feel lucky. Yes, I imagine as the game continues the difficulty will ramp up and any illusion of luck will fly out the window as every mistake is severely punished. Still, for my first foray into the game, the sense of randomness undermines my enjoyment. As far as my personal tastes go, the bigger role chance plays in a game, the less likely I am to enjoy it. I know in this case, luck is, for the most part, an illusion built on finicky controls and high-speed gameplay, but I still can't shake the feeling that my victories are not my own. I found that as I got better at the game, strategy and quick reflexes could replace most of my reliance on luck. The lock-on that you can do when playing with a controller helps an awful lot. I remember reading something about the "fake difficulty" of games like Super Meat Boy. It was written before Hotline Miami came out, but I think the principle still applies. I wish I could find the article itself. In short, the extremely-lethal-fast-respawn style of gameplay creates a sense of difficulty, but these games can usually just be brute-forced. There's definitely room for player skill and strategy, but ultimately, we're talking about some simple mathematical propositions. If you need to complete X objectives to "win" (make X jumps, kill X goons), then your chance of winning is just a function of the combined chances of each objective. The same thing is basically true of any video game, but the difference between Hotline Miami and, say, Super Mario, is that Hotline Miami typically only has a handful of objectives per stage, while Mario has dozens. Let's look at a simple Hotline Miami stage where you need to kill 4 bad guys. Let's say your chance of killing any bad guy is 75%. Your chance of winning is about ~30%, which means you'll quickly brute-force this level even if you never, ever get any better at the game. In other words, these games feel difficult, but they do very little to develop player skill. It is akin to playing Yahtzee and thinking you got "better" because you eventually rolled the same number 5 times. Hotline Miami makes matters worse because, as you said, it is an extremely twitchy experience, with AI that verges on totally random. I have to disagree with you, Grayson. SMB is very much a skill-based game, and there's no way you can beat the later levels unless you really become one with the controls. There's nothing at all twitchy about those controls. I also think that Hotline Miami is skill-based. As Joel mentions, strategy regarding how you kill each person and what weapons you use allows you to win pretty consistently as you grow familiar with all the alternatives. I don't know, I think I agree with both of you in a way. Later in the game, as actual difficult increases, I could see how I could be more heavily punished for my mistakes. That being said, the controls are fast and loose, so it's not particularly easy to know how to amend my mistakes. Considering how fast it i to get back into the game, I'm better off making a slight uninformed tweak and hoping for the best on the second go-around. That might be skill based, but it's not very thoughtful and still feels like I'm relying too much on randomness. I certainly don't feel smarter at lest. I'm not sure I entirely agree with the argument I posted either but I think there's a lot of substance to it. I personally got pretty bored with Hotline Miami towards the end. I felt I got good at the game but still had to deal with a lot of random losses. I couldn't even make it past the tutorial levels of Hotline Miami. There was something about the controls, perspective, music and overall art direction that just didn't work for me. As far as I could tell with my limited playthrough, difficulty had nothing to do with it. I am currently totally consumed by challenge runs in Dark Souls, a notoriously "difficult" game (which it really isn't). There is definitely a learning curve, but the sense of achievement after clearing each area and boss is incredible. The level design is so tight you can easily look back on every run and understand exactly how you died or how you succeeded. Failure is rarely random, mostly happening to trying to rush through the game, or simply learning how to proceed. I suppose by leveling high enough, or getting some of the heavier armors you could brute force through some of it, but by that point I imagine you would have learned at least the basic mechanics to get you through most of the game. I would love to see a Scott & Jorge play of Dark Souls and get some of your thoughts on its perceived difficulty. All enemy behaviors in Hotline Miami are deterministic (as far as I know), only gun and weapon drops are luck. 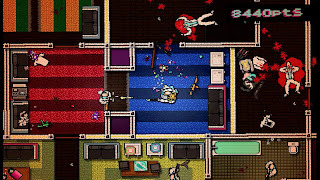 However it is massively different every time you play the level, so adaptation is a big deal in Hotline Miami, which is a GOOD THING. Games should be more about the back and forth adaptation and less about memorization and repetition.